My doll's identity is really hard for me to find! Hi! So, a few years ago my grandmother gave me a porcelain doll. She's absolutely stunning and I take very good care of her. She looks fairly modern. 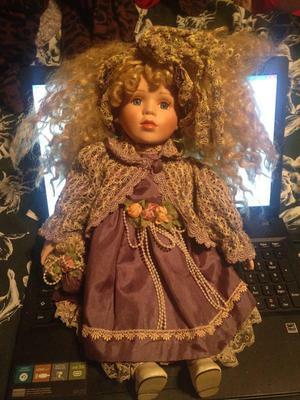 My grandmother isn't past her mid 60s, so I'm doubting that the doll is passed on. She just gave me her one day for no reason, without telling me where she got her from or anything about her -not even a name. She wasn't in a box and doesn't have a tag. She stands around 17 inches tall. 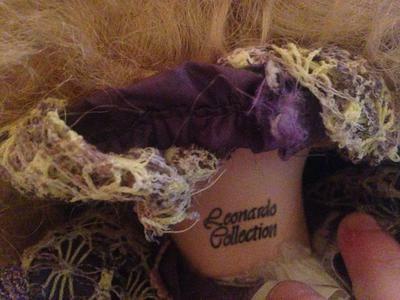 I have checked her neck for the maker and a mold number and have found that she's made by Leonardo Collection. I have checked on numerous sites with this collection's dolls, and Google images, but cannot find her! I can't quite figure out exactly what the mold number/code says, but I think I can make out "80". She has darkish blonde wavy hair (which is a wig) and wears a hairband. She wears a purple dress and cardigan with lots of lace and a few flowers and beads. She has the typical white bloomers, socks and shoes. She also has a small purple bag tied around her right wrist with beads. Her eyes are blue. Her body is soft. She is in very good condition and I can't find any marks or damage. I have some photos of her full body, a close up of her face, her maker's logo and her mold number. If anyone has any information or can help me find out about her, please let me know! Her name at least would be nice, but any other information such as where she was made or the date would also be very nice! 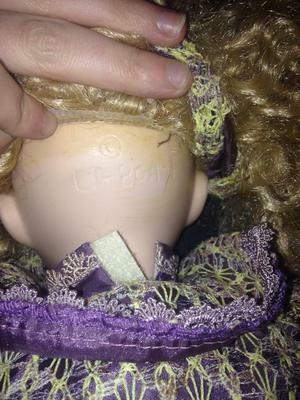 Comments for My doll's identity is really hard for me to find! 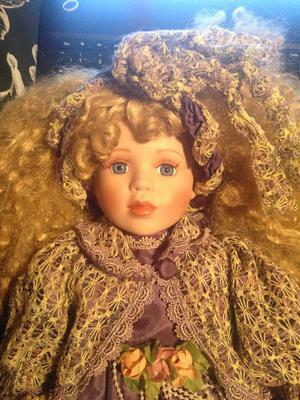 Trying to see if my dolls that I had gotten from my grandma is wroth anything because I haven't seen a couple of these at all. IT IS A LEONARDO DOLLS. There are many on Ebay and it does come up under Leonardo dolls on search for me.